I truly love life and wake up every morning full of gratitude. I mean if you think about it, we have so much to be grateful for, no matter what our situations may be. But life's not always perfect and things can get us down, even the most positive ones, including me. Like this morning for instance, I woke up feeling blue. It came as a shock because the mornings are usually when I feel the best but after a horrible dream about my dog being mauled by a tiger, my head wasn't in a good place. I knew that if I didn't do something about it, I'd find myself in a temporary depressive state, which is never a good thing. I'm sure we all have moments like this and we deal with them in our own ways. For me, I find that getting out of the house is the best thing to do, whether it be a brisk walk to get some fresh air, or like today, get out and force myself to explore the city. If you're the type of person who stays in, cooped up at home watching television all day, you might find it a good idea to get out and about. 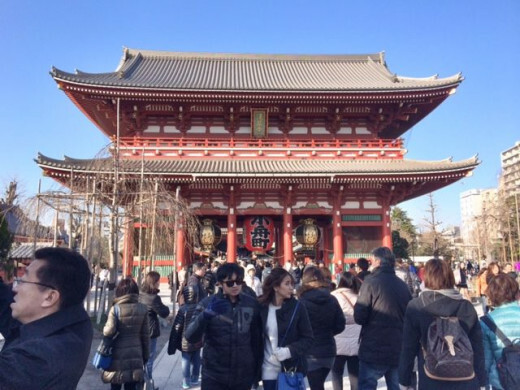 Well at least I hope you do after reading this because today I'm taking you with me to Asakusa, one of the best places to get lost in Tokyo. 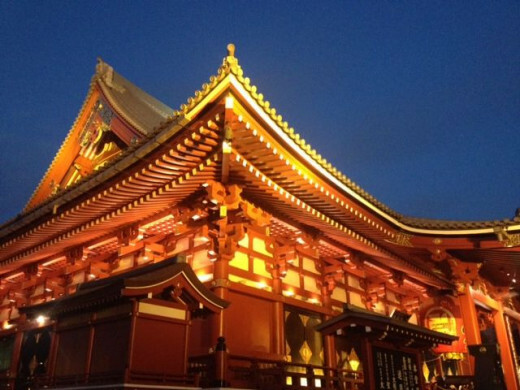 Have you ever visited Tokyo before? 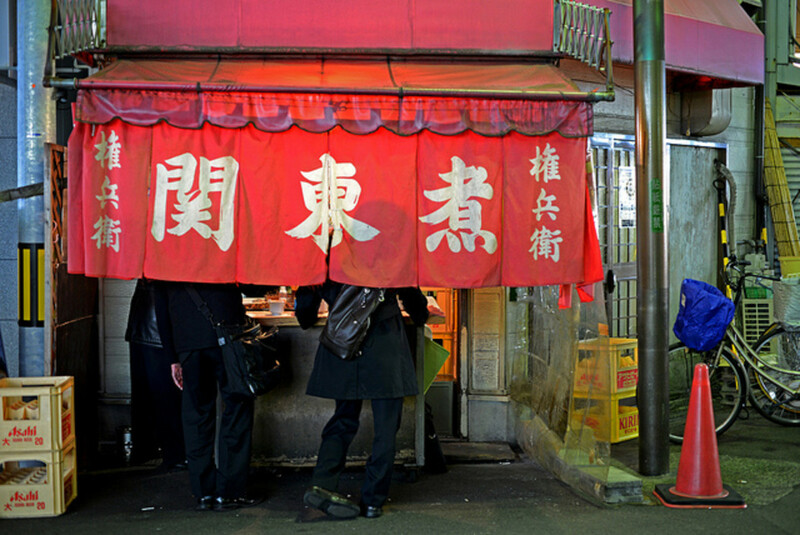 An illustrated tour of Tokyo rarely seen in travel guides. 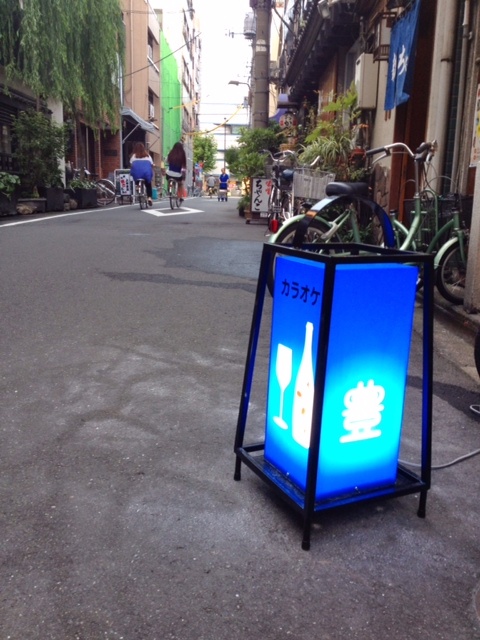 To browse through this book is to stroll through the streets of Tokyo. 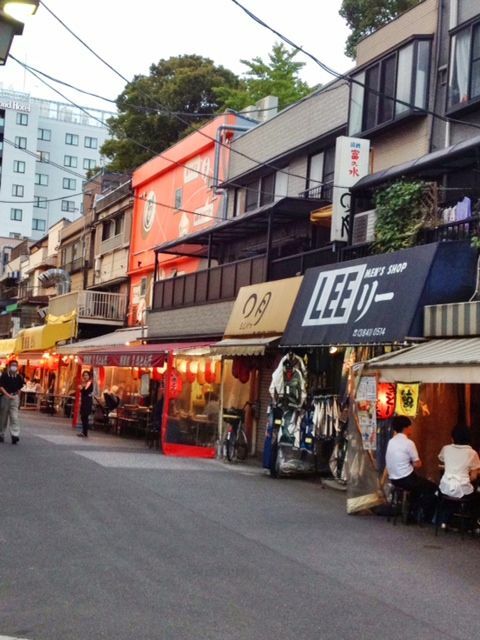 It's not always easy venturing out into the crowded city like Tokyo, especially when you're not feeling your best. I literally had to push myself ( with brutal mental force ) into the shower, get dressed and kick myself in the behind to get my foot out of the apartment. It was cold and I honestly just wanted to stay in bed. Despite my desire to stay indoors, I quickly throw my heavy down jacket on and grab my keys before I can change my mind. I'm out the door, down the elevator and walking towards the train station in less than a minute. Once I pass the ticket turnstiles at the station, I realize something very crucial to my plans. I have no idea where I'm going! As I stand there shivering on the platform waiting for my train to arrive, I quickly decide to pick the first destination that comes to mind. So what did I do to keep myself occupied for close to an hour commuting on the metro? I believe it or not, I'm writing this on the train as we speak! In fact, this entire story today is being written in "real time". Pretty cool don't you think? During my train ride, my nerves start to get to me - for me that means that the left side of my face starts to hurt and my vision starts to blur ( effects due to two past episodes of Bell's Palsy and panic disorder ). I tried my best to ignore the unpleasant sensations by keeping myself occupied with writing and feeling determined to enjoy my day. I finally make it in one piece and despite my fears, I'm here. I have arrived in Asakusa. Do you experience days when all you want to do is stay in bed all day? I feel like this a lot of the time. I feel this way a few times a year. It's rare, but now and then I do. I never feel this way. I'm basically a very happy person. 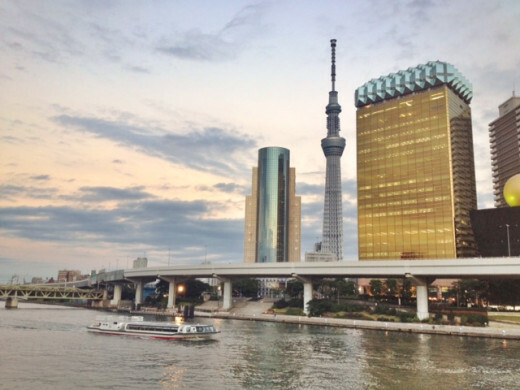 Tokyo is definitely a city that stands out from others. Huge, bewildering and so much to see, the city combines old and new and is both traditional and trendy. This photographic journey is perfect for the armchair traveler. As soon as I arrive,the first thing I notice is how crowded the place is but that's to be expected. 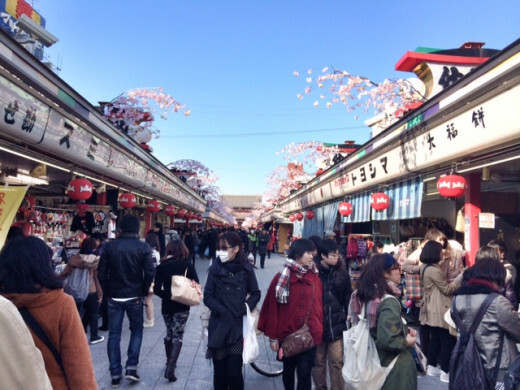 Asakusa is a major tourist destination for Japanese and tourists alike. As soon as I exit the underground, I breathe in a huge inhale of fresh air and look up at the clear blue sky. Even in the midst of a big crowd, looking up at the blueness of the sky makes me feel less claustrophobic and almost instantly, my discomfort disappears. I already know where I want to go so I head towards the red vermillion Kaminari-Mon ( Thunder Gate ), the entrance to the temple grounds. 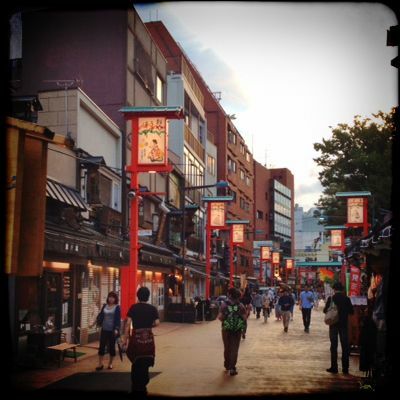 Walking along Nakamise-dori ( center shopping street ), I notice all the tourists from around the world, curiously looking at the unusual souvenirs and enjoying the traditional Japanese food stalls lining the street and this instantly puts me in a happy mood. Happiness and joy is contagious and it's abundant here. 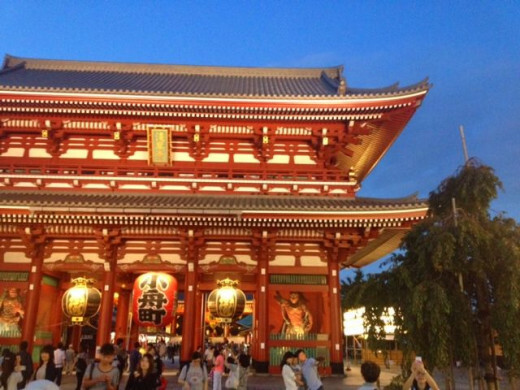 At the end of the shopping street, the huge structure that is Sensoji Temple, greets me in all its splendor. I walk up breathing in the incense that fills the air and make my way to the main hall, where I dutifully throw in a coin and pray for peace and happiness. As I walk out of the prayer hall, my head feels clearer and I start to wonder why I felt so bad this morning. 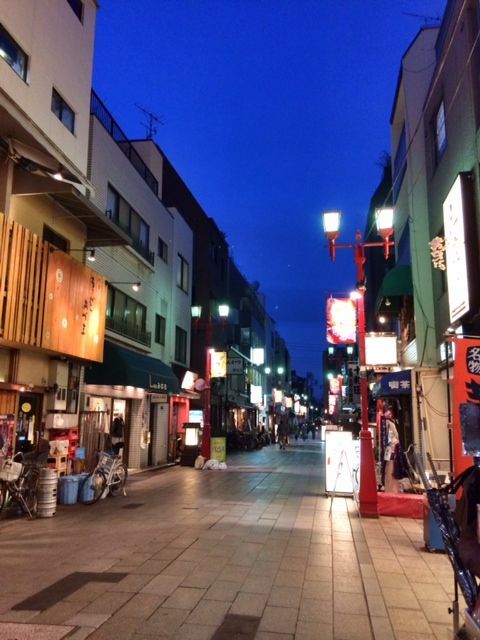 I feel good enough to continue exploring Asakusa and head towards the small side streets that criss-cross the city like a labyrinth. 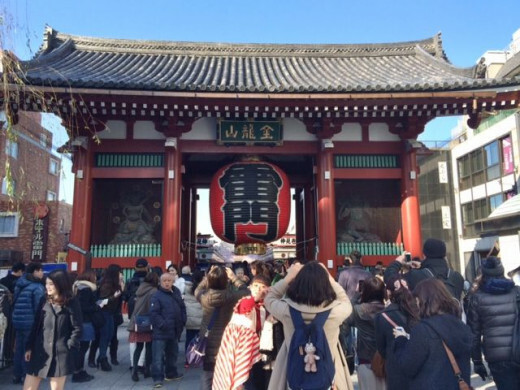 The first thing we encounter is Kaminari Mon ( Thunder Gate ), the symbol of Asakusa. The vermilion red color is bright enough to see from afar. 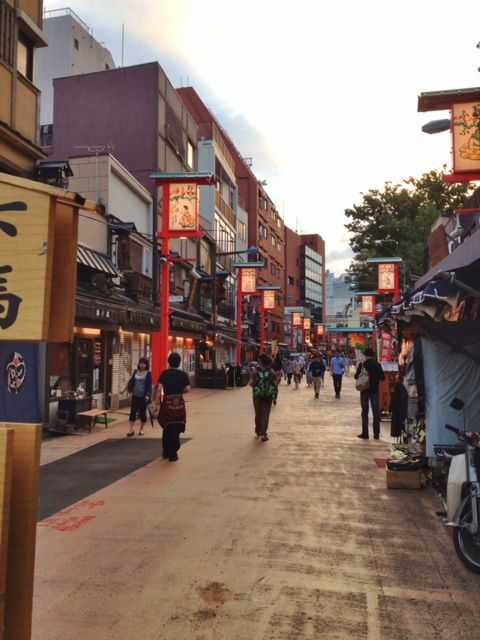 Leading from Kaminari Mon to the main temple building is Nakamise-Dori, a shopping street 200 meters long, dating back to several centuries. 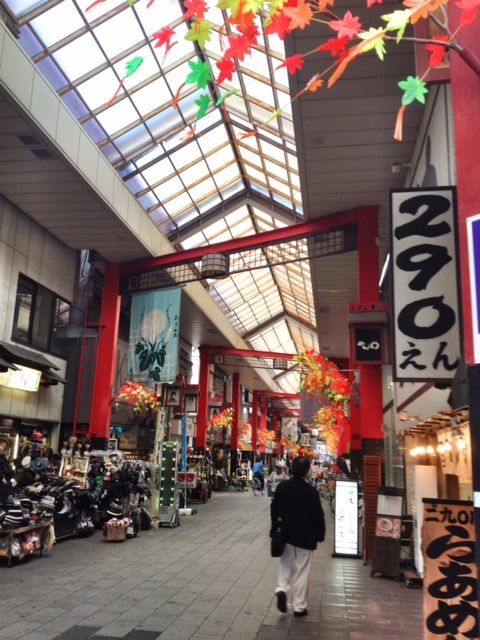 I love strolling through this street full of traditional shops and kitschy tourist traps. 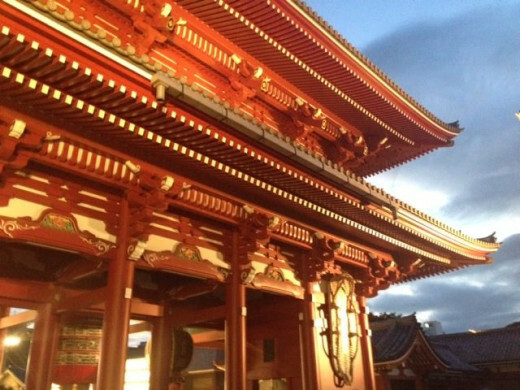 The temple was completed in the year 645, making it the oldest temple in Tokyo. When you travel, what is your priority? Visiting the main tourist spots such as the Eiffel Tower. Going off the beaten track to discover something unique. Visiting a few main spots with breaks of non-planned exploration. One of my favorite things to do in any city I visit, is to comb the streets one at a time, looking to discover interesting and this is exactly what I do. I take risks turning into unfamiliar streets, which rewards me with new sights, unknown shops and hidden treasures. Buildings that hark back to olden days make my heart beat just a little slower. There are less crowds here. Just the rhythm of everyday life, with locals going about their daily life. It's 5 PM and the temperature has dropped to 2C and I need to warm myself up in a cafe and I need to find one fast. I am shivering and I forgot to bring my gloves with me. After a good 20 minutes, I find a decent cafe and order myself a hot cup of organic tea. As I sip the hot liquid, it warms my body instantly, making me appreciate the tea even more. How could a simple cup of tea give me so much comfort? I get my Ipad out to continue writing. Hey, look over there! An old-fashioned arcade street. Inside it looks like this. 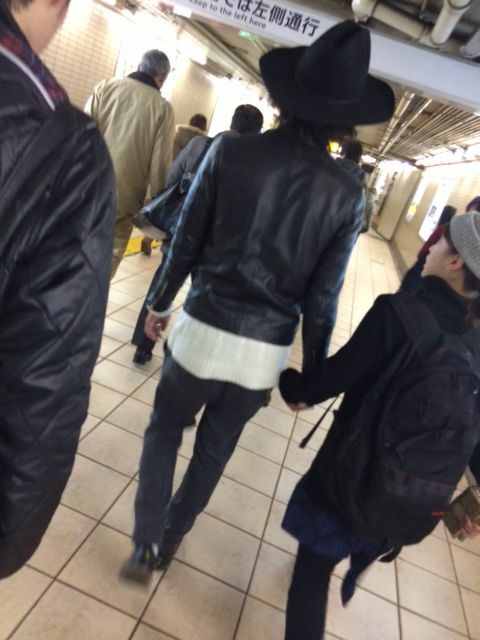 You'll find these all over Japanese cities and they protect you from inclement weather. 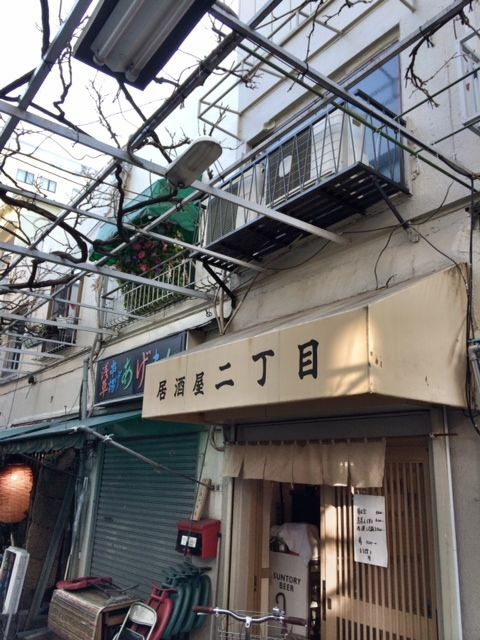 My favorite sweet potato shop which has been running for over 100 years. 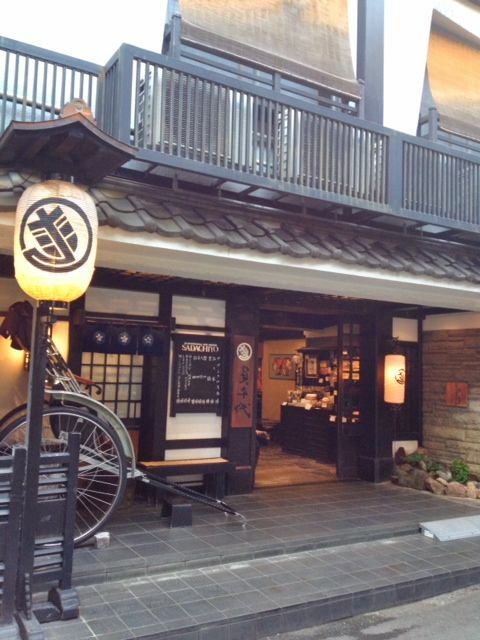 An old-fashion Japanese Inn that welcomes everyone to stay and rest their weary feet. Lots of interesting things to see even at ground level. 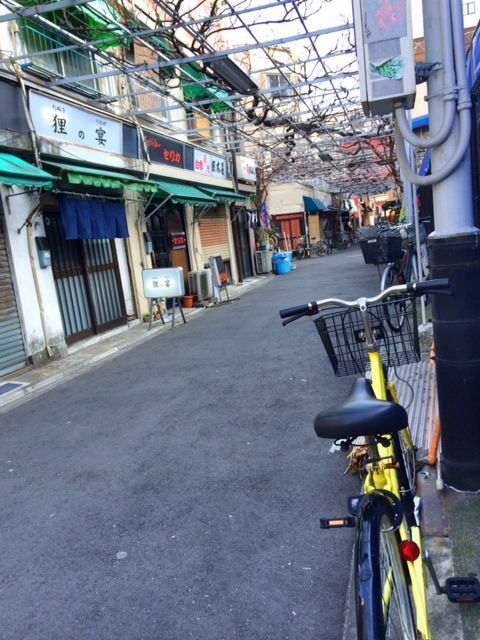 The traditional streets are littered with mom-and-pop shops. 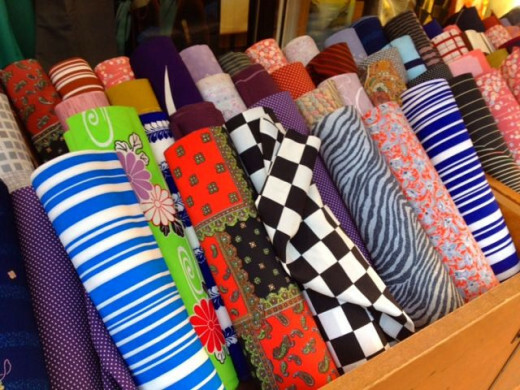 If you're looking for kimono fabrics, you'll have fun browsing the shops here. Drinking establishments line this random street. What's this mannequin doing here? Let's take a look. 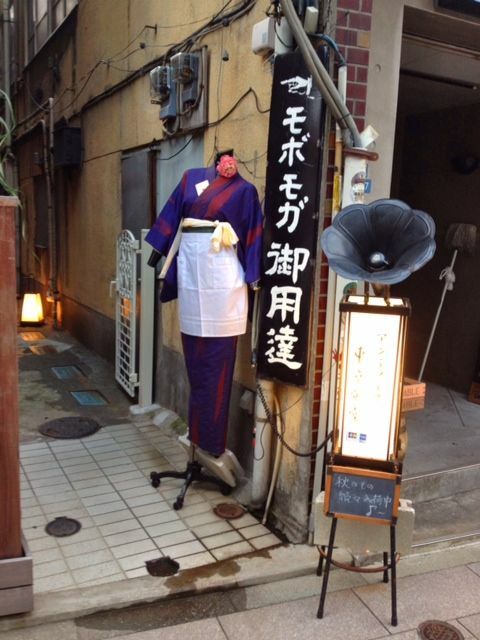 It's an antique store tucked away and hidden deep within the labyrinths of Asakusa. 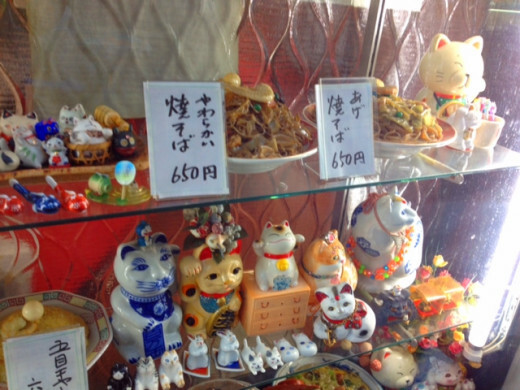 Plastic food displaying friend noodles. $6US for a plate of noodles sounds like a good deal to me! Some of the streets are empty during the weekdays and that's just the way I like it. People usually live on the 2nd floor while they run a business on the 1st floor. 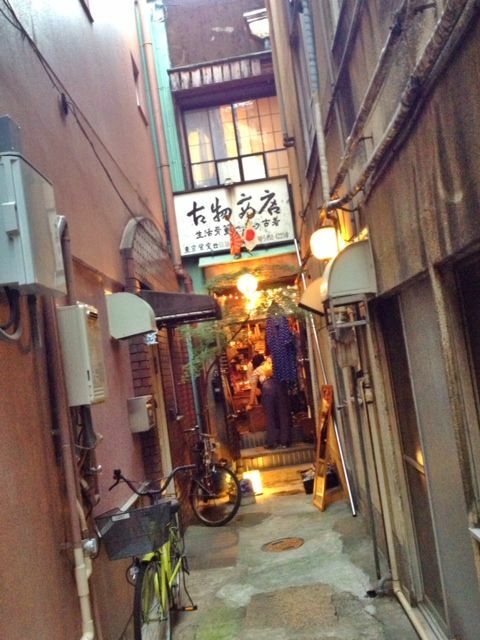 A hidden street full of tiny cubbyhole-sized bars ready to explore. 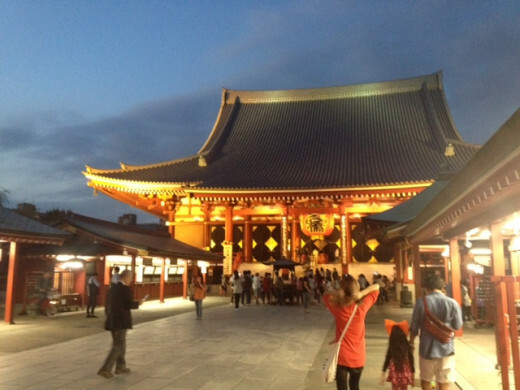 Twilight is when magic happens in Asakusa, especially the area right around Sensoji Temple. Perhaps I've been too busy going from one place to another every time I've been here before, but I realize that it's my first time here at night. I wonder why I never came here at night before. I feel the excitement of seeing something for the very first time as I marvel at how different everything looks when it's dark. The great thing about traveling solo is that you get to choose how long you want to stay, and how you want to spend your time. The wind is starting to blow and the temperature is bone-chilling so I decide its best to head on home. 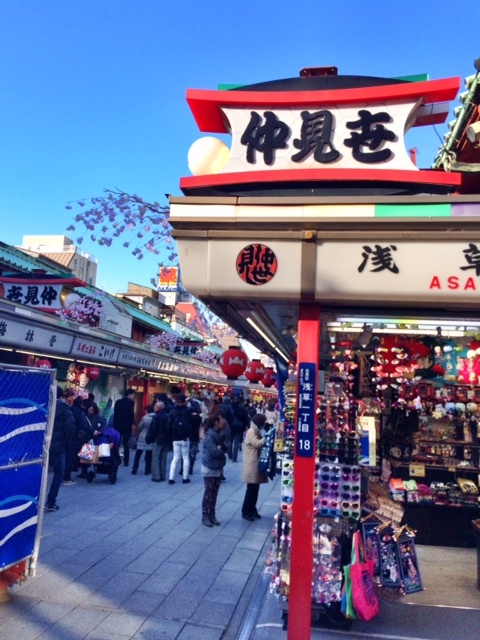 I soak up the atmosphere of Asakusa one last time before deciding to board the train back home. 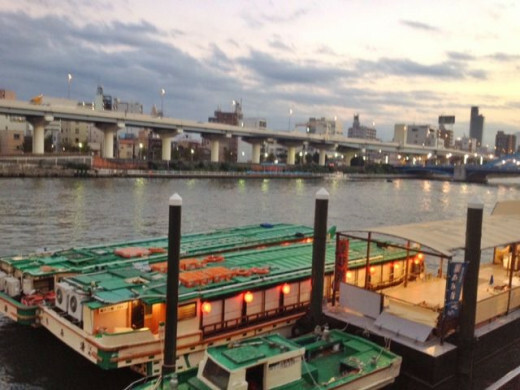 Don't forget to check out Sumida River right next to the temple. The futuristic buildings on the other side makes a dramatic contrast. 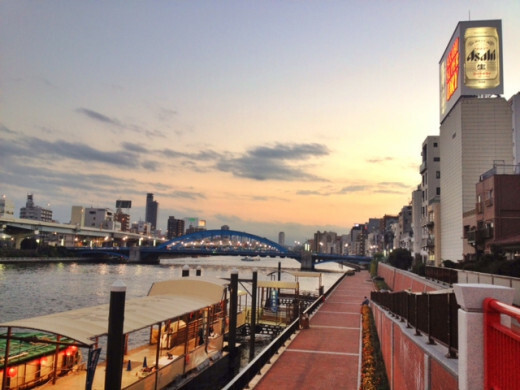 A walk along the river front is serene and romantic. Take a seat on one of the benches and watch the sun set. 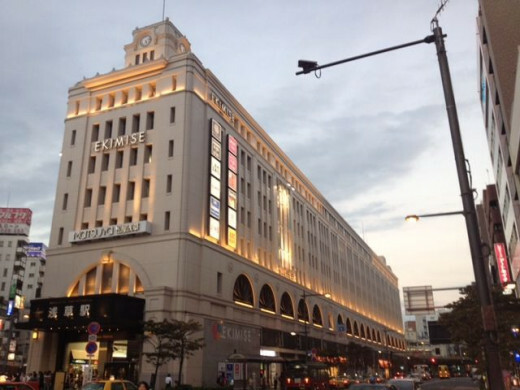 Matsuya Department Store was founded in 1869. 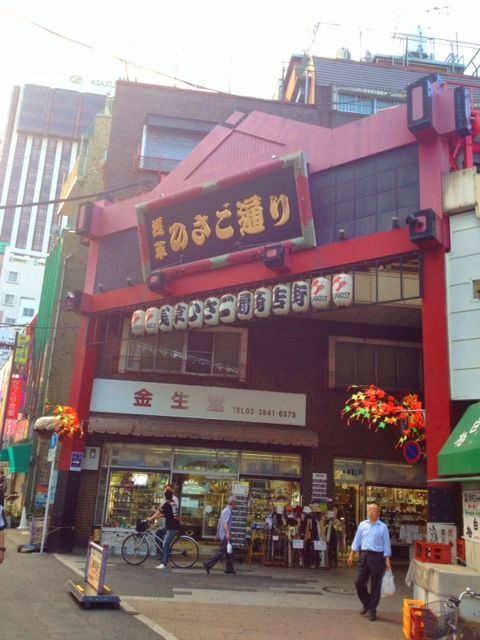 Right across from the department store, you'll find Kamiya Bar, established in 1880 as the first western-style bar. 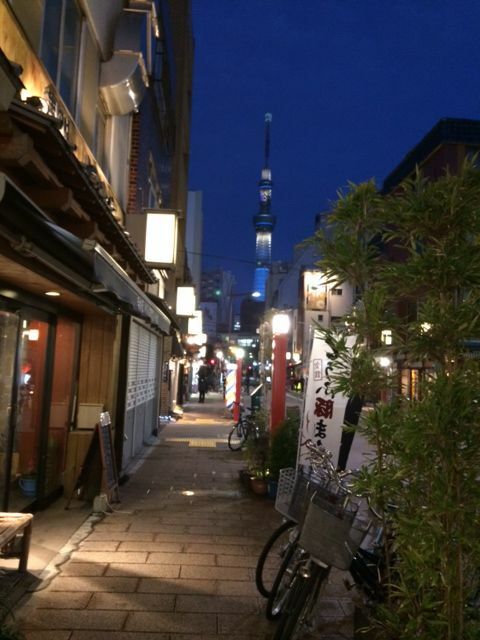 The Sky Tree in the distance from the old streets of Asakusa. At night, the streets are even more magical. The temple buildings light up giving visitors one last view. The temple is stunning from every angle. Why have I waited so long to visit here at night? It's less crowded after the temple closes for the day. One last look at the temple before heading back home. Ok, just one more glance. 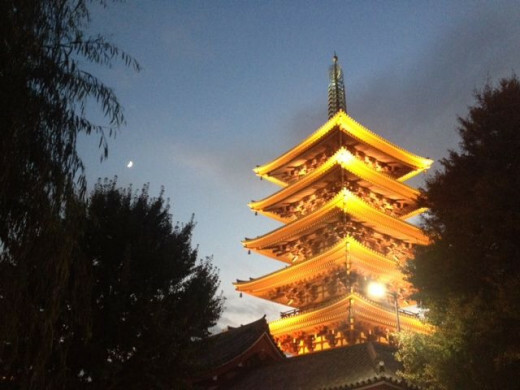 The pagoda stands tall over the entire place. 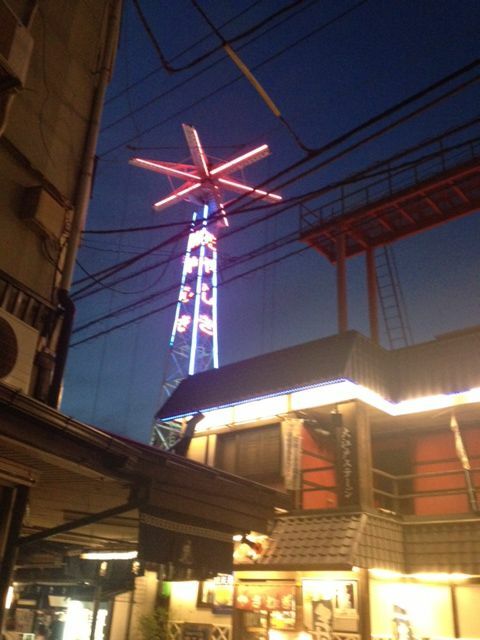 The towers of the oldest amusement park in Japan sits near the temple grounds. Now it's time to walk down to the metro to take the train back home. At the end of the day, I am once reminded of the strength we have in ourselves to overcome our personal obstacles and fears. And I'm reminded of it all the time. By replacing my fears with things that I enjoy as well as challenging myself to new things, my fears slowly lose its potency. It's hard to believe all those years spent not leaving home all day, a place that was both a prison and a safe haven. No longer do I want to stay living like a hermit. These days, even when things are not quite right, the world awaits me with open arms, ready to embrace me with all it's beauty and wonder. 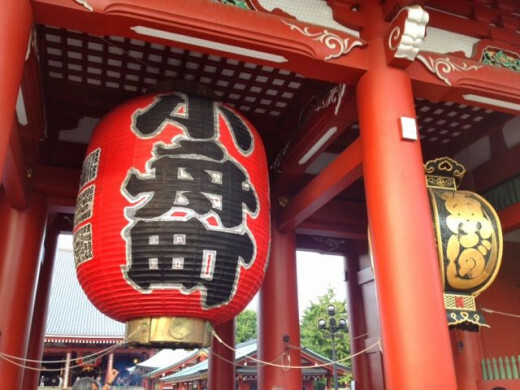 Would you be interested in visiting Asakusa on your visit to Tokyo? 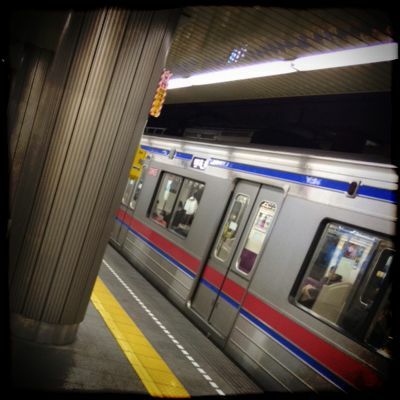 It is my hope to show you a glimpse of life in Tokyo from a personal perspective. Living in a big city makes it too easy to forget the small things in life that makes it so beautiful. There's a whole world out there ready to explore, even in your own back yard! Here are some other articles you might enjoy reading. 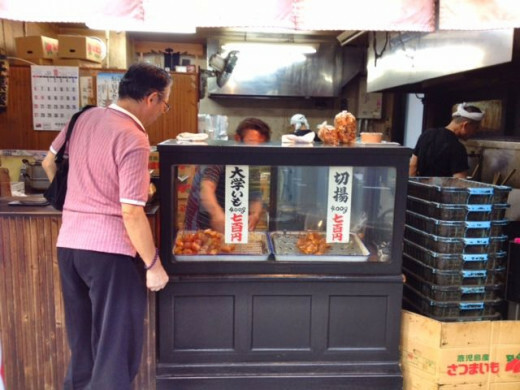 If you enjoy food and travel, be sure to check out my blog over at TabiEats. 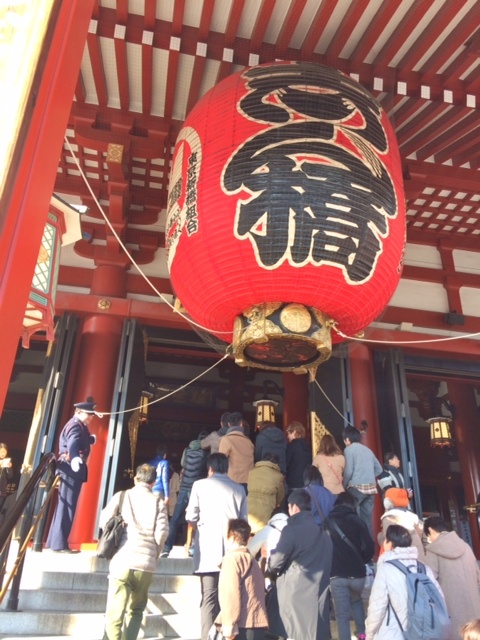 I Hope You Enjoyed Your Visit to Asakusa. Don't forget to Leave Me Your Comments. They are Always Appreciated. Thanks! Japan is next on my to do list. 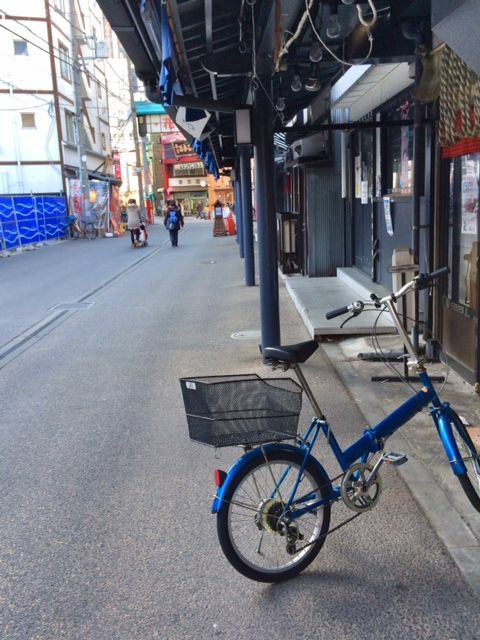 @ecogranny: It's always my pleasure showing around my city. I always appreciate your visits Grace. @smine27: I was wondering how you managed Squidoo on an iPad, as I've never been able to work efficiently on mine. Are you able to upload images to Squidoo and post your copy in the modules on your iPad? I've never even succeeded at that, but I haven't tried with the new operating system. 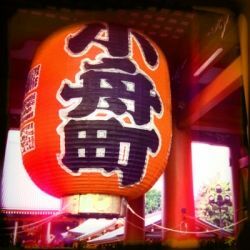 Your snapshot journeys of Tokyo and Japan, with your insider viewpoint, are a wonderful opportunity for me to see and to imagine experiencing places I doubt I will ever have an opportunity to visit. Thank you for another lovely journey. @MariannesWhims: Thanks so much. It was fun! @TerriCarr: I do use a keyboard for easier typing. I actually don't write my entire article on the iPad as that's literally impossible to do as the Squidoo formats don't particularly work well with the iPad. I basically lay out my lens before I leave home. That way I can finish it off on my iPad "on the go". Beautiful photos! Such a cool idea making a lens as you go. Thanks for sharing your day trip. I truly enjoyed it. I love that you were creating this lens on the train. A benefit of having an ipad which can do photos too. However, I have heard that the ipad is not great for typing very much because the onscreen keyboard is kind of small. Do you have any issues with that? Or perhaps you use an attached keyboard at home? Just wondering. @TanoCalvenoa: I look forward to welcoming you and your family here. I love the positive spin and tone you're put to your writing here. And, the pictures are amazing. 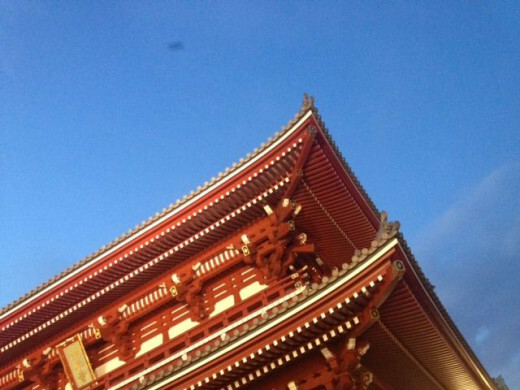 You're not only a talented writer (making me SO want to visit Tokyo) but also a great photographer. I love your lenses about Japan, they bring a country far away up close so I can really see what it is like. I'd love to visit Japan someday! @gottaloveit2: Thanks so much for the kind words. I do hope you visit one day. There really are so many things to see here. @MarathonRunning: I do hope you can visit one day. @VspaBotanicals: The aka so much. 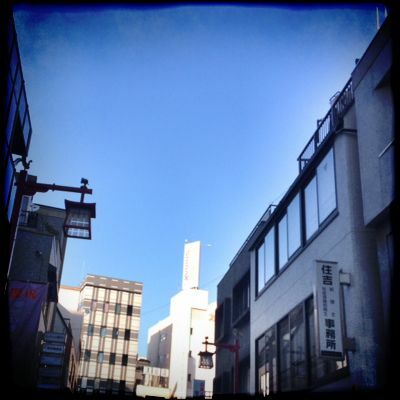 @Minoru10: Hope you visit again soon! 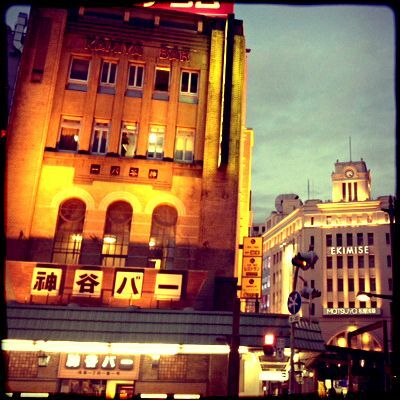 @GeorgeneMBramlage: Cercis I'm the same way when it comes to shops. I can't resist! @Dave Lynch: Thanks so much. It was fun writing on the move. @GrammieOlivia: Hopefully it says that way. No more snow please! Thanks for visiting. @Nancy Hardin: Thanks so much Nancy. I don't know much about the "other side" of Las Vegas. It would be interesting to learn about that. @Merrci: You always write the nicest thing. @SteveKaye: Thanks so much for reading. 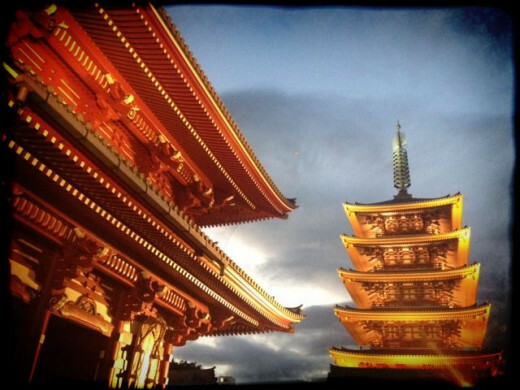 I so much appreciate the chance to explore Tokyo through your writing and all those wonderful photographs. Keep 'em coming, please! @flycatcherrr: Thanks so much. More is on the way! Thank you for a nice and interesting trip. 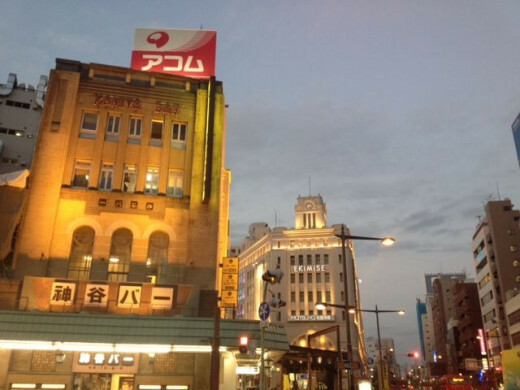 I`m in the many who hope to visit Tokyo someday so your personal stories of this enormous city are more than welcome from me, but I`m sure that you make an enjoyable visit to your articles for many. I would love love love to go there! Beautiful lens! I enjoyed going back to these places with you. 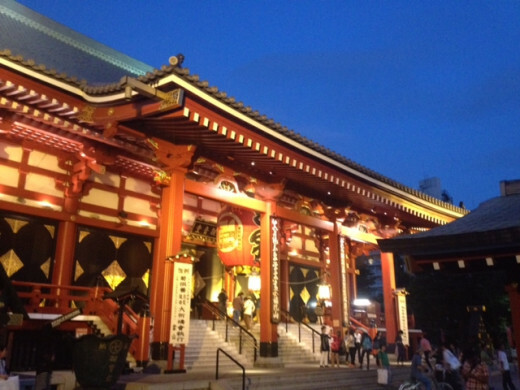 Oh, and you're right, Asakusa looks really beautiful at night. Sigh. The magic and all.... and the beautiful Tokyo sunsets. I would have lost myself in the shops and foods stalls on the way to the Temple...probably arriving there late in the day. I like to take my camera and turned-around backpack and wonder through new places taking photos. Your photos are well-done and set the mood instantly. I never would have thought about writing as I explored. This is such an exciting concept and I thank you for introducing it to me. I will have to think hard about venturing to Japan. This looks like an interesting place to visit and like that you wrote the lens on the move. This was a nice break for me, no snow in any of your pictures, that is refreshing! I tell everyone about the "other side of life" in Las Vegas. It's not all gambling halls and that sort of thing. We have interesting areas to explore too. I love that you share Japan with your readers, and thank you so much for doing so. As you know, it's my way of "traveling." Your photos are so beautiful! Nice little trip you shared here, Shinichi. I enjoyed it. Your photos are lovely. Thanks for sharing the day with us. You give excellent tours Smine27! Enjoyed reading about your day and see the wonderful photos. I'm so pleased for you that you made yourself get out and go. A reward for you and us both! Thank you for publishing this wonderful tour.